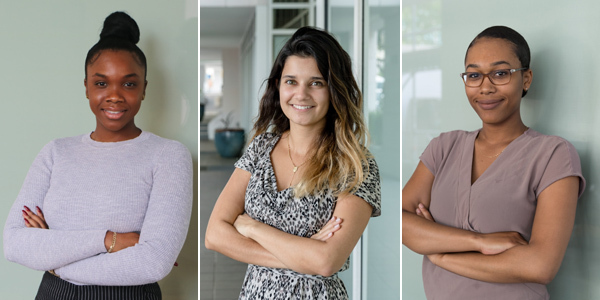 KPMG in Bermuda said they are pleased to celebrate their colleagues Danielle Richards and Chelsy Furtado who earned designations as Chartered Professional Accountants, and Brianna Buchanan who earned a Certified Professional Accountant designation. “This is such a wonderful milestone in their careers, and it is rewarding to see trainee accountants in our Lift Off Graduate Program become qualified accountants. It also takes on special significance when we are able to support the growth and development of Bermudians,” said Steve Woodward, Managing Director and lead of the KPMG Graduate Program. Danielle Richards joined KPMG in 2014, as a Staff Accountant in Banking & Asset Management. A graduate of Acadia University [BA Bus. Admin/Accounting], she was on the Dean’s list twice and she has been recognised with many awards throughout high school and university. Ms Richards said, “What a relief it is to have completed my CPA exams and designation; it is indeed a prestigious designation that I will carry with me for the rest of my career. The road hasn’t been easy, it has required sacrifice, perseverance, and determination. Chelsy Furtado joined KPMG’s Enterprise team in the summer of 2015, as a recipient of the Bacardi Scholarship and the KPMG/Bacardi Reciprocity Program. She rejoined our firm in October 2016, as a Staff Accountant. She attended Acadia University and received a Bachelor’s degree in Business Administration/Accounting. Ms Furtado said, “For some, accounting may be about numbers but for me, accounting was a world of possibilities. Ever since my first accounting class in grade nine, I knew that I wanted to become an accountant. Brianna Buchanan joined KPMG in 2014 as a summer intern, having received a KPMG Scholarship and participated in the KPMG/Bacardi Reciprocity Program. She rejoined our firm as a Staff Accountant in January 2018. She is a graduate of the University of Alabama [BA Bus. Admin & Finance] where she earned her Masters in Accounting and was on the Dean’s list throughout university. Ms Buchanan said, “After putting months and countless hours into studying for these examinations, I am overwhelmed with excitement and joy to be able to say I have successfully completed the U.S. Certified Public Accountant exam process. Well done Danielle! Your Dad would be so proud! I know your Mom and Brother are so proud of you as well! Congratulations on your great achievement young lady! More proof that CBA produces excellent students!